Regarding the holes in the walnuts, I had a consultant indicate to me that he thought we had a boron deficiency causing the problem. However in our case the leaf test showed boron to be in the low normal range for walnuts and further I also found that whether we had holes in the nuts and if so the size of them varied from year to year. From our experience the wetter the season the more holes and the bigger they were. I can’t explain why, I just give this as an observation. I was a member of the NZ Walnut Industry Group committee for a few years and nobody on that committee at the time was aware of what the cause for holes in the shell were. Have read the bits about what I think is called eutrophication, i.e. overloading with organic matter, as a general rule bury dead animals outside the drip line of trees, make the tree go looking for the food, this way it extends its root system, my gut reaction to adding such as grey water to the soil, it should be no more than 10% of the rainfall, otherwise you can have problems. a. Does anybody have good data on what level is deficient.. we have 20~25ppm (late Jan leaf test) but no ‘very obvious’ signs of deficiency. Applying Zinc foliar sprays with mankocide (standard blight management) seems sensible.. but there is a cost and ‘rumours’ of phytotoxic effects… does anybody have any experience/data/wisdom? Our walnut leaf analysis at Cheddar Valley in BOP, admittedly 20 years ago, but still valid, showed a range of 19 to 34 (av.24) ppm over six plots. Our pecans show no obvious zinc deficiency symptoms, even though that species is very sensitive to zinc levels. But some of our citrus do show zinc deficiency, and will not fruit without soil and foliar zinc feeds. I have not had any noticeable response to zinc from my walnuts. Just the same, because the citrus are short, I add zinc to my walnut fertilizer anyway just in case. The plots where I got these zinc foliar levels from did show an interesting thing about walnut nutrition. All the plots got my usual fertilizer application (at the time, of Urea plus Superphosphate), but half got an extra dose of Urea two months later. The plots with the extra Nitrogen grew less than the control, and the leaf analysis showed why. The plant responding to the Nitrogen, demanded even more of the other minor nutrients, which made them even more limiting. The Magnesium readings in particular dropped significantly. As a result, my approach to walnut nutrition is that, the better fed they are, the more attention I pay to the overall balance. This is borne out by my pig poo experiment I described in the last blogletter. So now, as a matter of course, I add Magnesium, Manganese, Zinc, Boron, and Iron. I add the iron because it is meant to aid the uptake of magnesium, or so I am told. Has anyone else done foliar analysis on their walnut leaves that they can share with us? 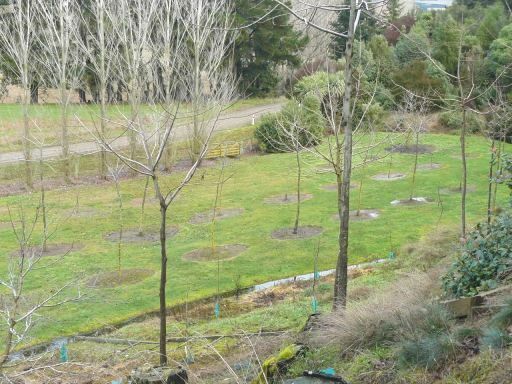 Tony Walker sent in this photo of his walnut trees. There were more, and they can be seen on my Facebook page, under ‘Pruning’ photos. We are at the top end of Marshmans Road about 10kms inland from Amberley, just north of the Kowai River. We have about 85 walnut trees, mainly planted between 1999 and 2003 but with a few blanks since then. All the development we have done here has been with future generations in mind, recognising that few of the thousands of trees we have planted will reach their best potential during our lifetime. So it was with the walnuts. Although we have been totally un-scientific about their selection we wanted to produce some walnuts for consumption and the majority for good timber in future years! None of the common walnuts are named varieties and all, including the black walnuts, were obtained from Woodend Nurseries . Basically we are pruning both types to a clear height of 3.4 -3.6 metres as they reach an appropriate height, and waiting to see what happens next! The first common nuts were produced in 2009 and the first nuts on the Black trees came this year. Generally I prune in June, whether all the leaves have dropped or not. One year I did it in late August but didn’t like the amount of ‘bleeding’ from the cuts. >Im planning to visit New Zealand walnut growers for buying. A major reason for doing this blogletter is to help people find out what the industry is doing, and that includes products and services that are available. We need to know about walnut nurseries, equipment suppliers, cracking plants, or walnut buyers (as above). I make no recommendation about any of their products or their authenticity. Most walnut growers know about the beneficial effects from eating walnuts because of their high Omega-3 content. But the other day, Anna Brenmuhl, sent out this article to members of the WIG committee, as it contains significant new information. A new clinical study shows that substituting walnuts for mono-unsaturated fat in a Mediterranean diet improves, and even restores, endothelial function (the property of arteries to dilate in order to meet an increased demand of blood, for instance due to a physical effort). Walnuts also reduce harmful cell adhesion molecules which are associated with atherosclerosis, commonly known as hardening of the arteries. These dual effects enhance the circulatory system, therefore aiding in the prevention of heart disease. Walnuts happen to be a wealthy plant source of omega-3s, the fatty acids also located inside cold water fish like salmon. Omega-3s are known to decrease the threat associated with a host of health issues from depressive disorders to heart disease. Walnuts are also crammed with gamma tocopherol (a type of vitamin E), phytochemicals also known as as polyphenols, as well as antioxidants. So now, for the first time, experts have documented that these nutrient-rich nuts provide the capability to help diminish the size as well as advancement connected with prostate cancer. Researchers from the University of California-Davis just revealed their finding at the 239th National Meeting of the American Chemical Society (ACS), being held in San Francisco this week. On a more anecdotal level; my wife, Pauline, heard a nutritionist on the radio the other day, saying that you should not eat more than 30gms of nuts per day. That is quite a lot, but we need to hear that because we tend to binge on them a bit in our house. My reaction to the email from Clive Marsh about bud burst times was, “What practical use is this to me?” But as the season has progressed, I came to realise that I should be taking more notice of bud burst times. Up in the Bay of Plenty we may not have a problem with out of season frosts, but the winter weather (or rather lack of it) has had a pronounced impact. Lack of winter chilling has resulted in a very hesitant leafing out. Early varieties like Serr, have leafed out as normal, but late varieties like Franquette have been very late and variable throughout the tree. Some branches would be in full leaf with quite large nuts, while other parts of the tree would have buds just starting to burst. It will be interesting to see what effect this has on the nut crop. Thank God for people asking unlikely questions. Keep the comments coming!